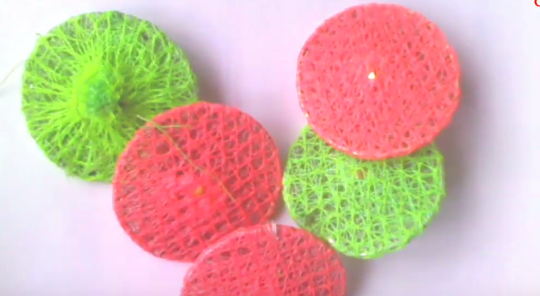 This is one of the most common and popular way of making DIY wall hanging out of old unused Bangles and Net Shopping Bag. From my childhood I had been seeing this wall hanging made by my friends, relatives, neighbors everywhere. So I thought why don't I make one for myself and upload a video tutorial for you guys. You know I always love to share my works with you. Though I am not that good but I try. I believe there are always rooms for learning new things. I am always ready to take your suggestion to improve myself. bangles and shopping bags that are the main elements we need. The other things we need are some threads to unite them together and some beads and glue to decorate them. That's it. Quite amazing right? 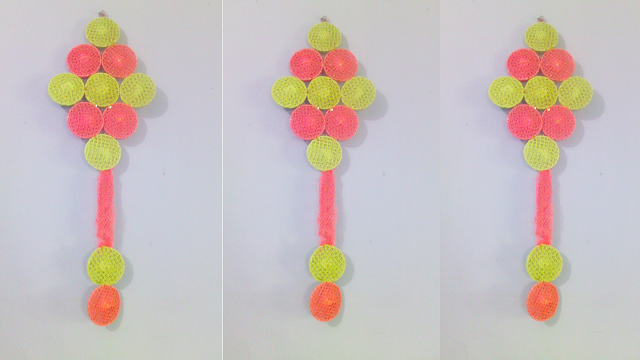 Just a few things and there you can make an amazing DIY Wall Hanging for your wall decoration. The procedure is very simple. At first you have to think about the wall hanging that how it should look like or how you want it to be. After visualizing the look of wall hanging you will get an idea that how many bangles you need. 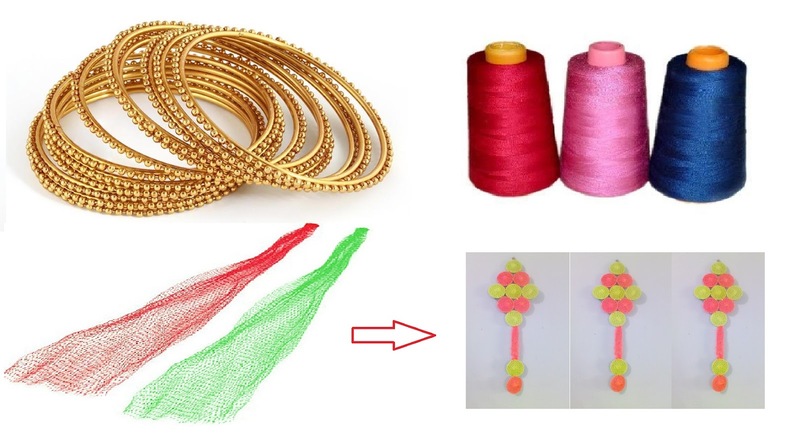 Now wrap the bangles with shopping nets using threads. The next step is to arrange all the wrapped bangles with threads. Now you got that shape of your desired wall hanging. Then its time to decorate it. I used some simple beads. You can use anything as you like. You can follow the video tutorial below to understand easily. Hope you will like it. Thanks for going through this tutorial. I hope I will continue to make more recycled crafts and share them with you. I have developed a Facebook Page called Recycled DIY Ideas-Sania Crafts. Like this page to get more ideas. I have a section of this page on the right side of this webiste too from where You can directly engage . I also want to learn from you and see your works. So lets build a healthy community of craft loving peoples by joining this beautiful Facebook Group.